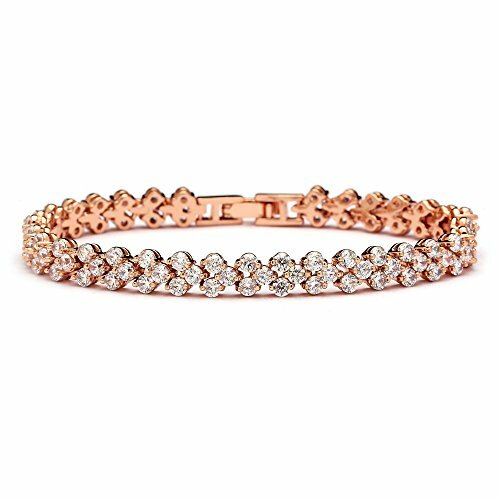 Meticulously crafted with the finest quality CZ gems and plated in genuine 14Kt Rose Gold, this lovely 6 3/8" petite-sized bracelet packs a lot of sparkle in its deceptively simple design. Whether making your grand entrance down the aisle or wearing this sparkling Pink Gold stunner to the office or nights on the town, you'll love the versatility of Mariell's stunning AAAAA quality Cubic Zirconia bracelet. At last, a high-fashion zircon bracelet that offers that hard-to-find perfect fit for petite smaller sized wrists. We promise you'll love this top selling tennis bracelet or your money-back. Treat yourself or someone you love to some seriously gorgeous Blush Gold sparkle with the look for genuine diamond jewelry at a fraction of the price. Lifetime Guaranteed.